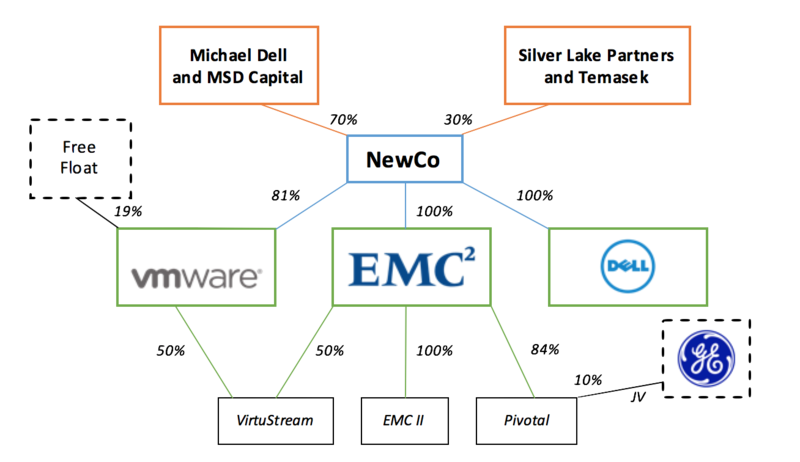 On October 12th Dell (which is a non listed company), in collaboration with Silver Lake, have entered into an agreement for the acquisition of EMC (NYSE:EMC, on 27/10: 26.17$), bringing the majority of EMC’s assets private while maintaining VMware publicly traded. The $67bn Dell-EMC deal represents the largest technology acquisition in history and the largest US M&A deal of 2015, despite this year’s record M&A volumes. EMC shareholders will receive $24.05 in cash plus new shares tied to VMware, a software company that EMC already controls. 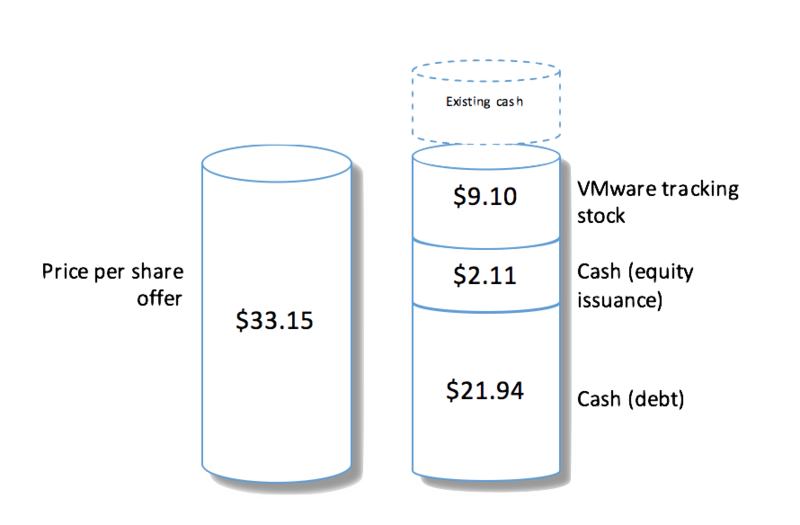 The exact headline value of the deal will therefore depend on the VMware share price. This structure will be analyzed in detail below. EMC, together with its subsidiaries is a global leader in storage, security, virtualization and cloud computing solutions, with annual revenues of over $24bn and can therefore boost Dell’s servers and networks segment significantly. 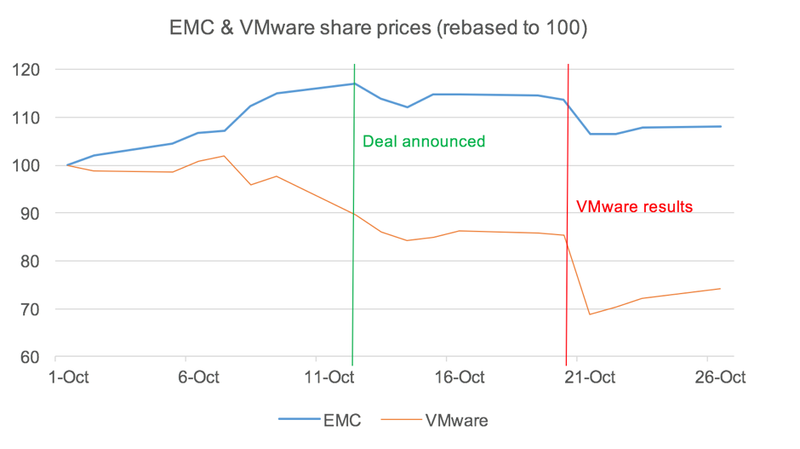 The reaction of VMware and EMC share prices on the deal can be seen below. Dell is a private-held multinational company developing, selling and repairing computers and related products. From 2008, it slowly moved to implement new services like data storage with the acquisition of EqualLogic and since then, it rode the wave of “softwarization” through other acquisition like Boomi, an integration leader offering software as a service (SaaS) solutions, AppAssure, a support for server like VMware and Credant Tech, a provider of storage protection solutions, continuing to diversify its business and presence in the US. Dell is well known for its innovative business model, the Direct Sale model, creating an efficient way to sell its products and giving itself a competitive advantage over manufacturer competitors like Hewlett Packard and IBM. Now, the Internet of Things is creating new opportunities in the market, it involves digitalization and data, two core solutions Dell has been investing a lot since 2008. EMC is a global leader in selling data storage, analytics and cloud computing solutions helping businesses of various size to use a vast amount of data efficiently. Since mid-80s the company has been developing innovation in the field of information storage, in 2001, as Joe Tucci was named CEO, the company went into a vortex of transformation which changed EMC’s offering to IT solution like cloud computing. In 2013, EMC formed together with Pivotal and VMware, its new business model. VMware is known for developing products and services in software defined data center (or SDDC), end user computing, and hybrid cloud computing areas, which give flexibility to the big infrastructure of data storage given by EMC and Pivotal, that deals with big data, cloud applications, security application systems, and data management system. The tech and computing market has moved from traditional devices towards mobile devices and cloud computing. 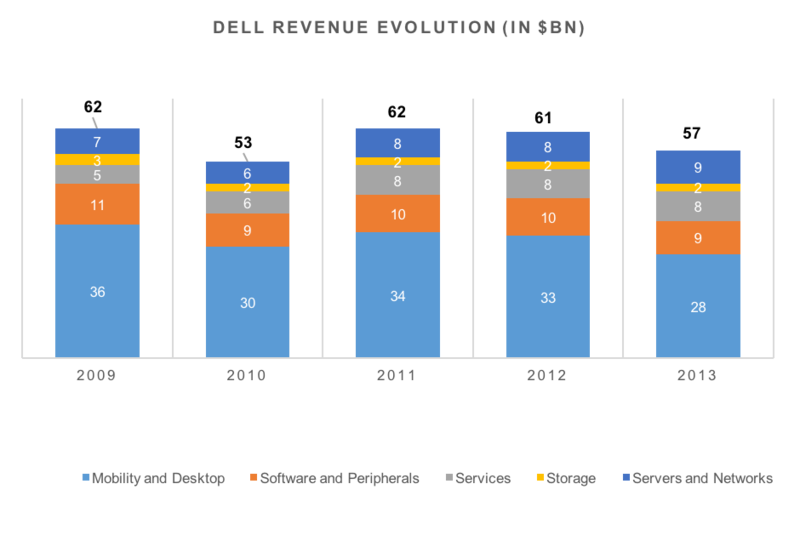 Half of the revenue of Dell comes from the Client computing devices department which, together with all the other divisions, apart from the two linked to mobility and cloud computing – Servers and Networking and Services, has suffered from the market move described earlier, with a multi billions decrease in revenue. The ownership of the company is fairly simple: Denali is the holding company with a 100% stake in Dell. Michael Dell (with its investment company MSD Capital) owns roughly 70% in Denali with the rest being a stake owned by the Menlo Park, California based Private Equity Firm Silver Lake through its large cap division Silver Lake Partners. EMC has worked on the project to merge its cloud computing related subsidiaries – Pivotal, VMware, Virtustream and VCE – with the aim of creating the biggest cloud computing services provider in the industry. The ownership of EMC is even simpler than the Dell one being it a public company; indeed, roughly 98% is public float while the rest 2% is in the portfolio of shareholder activist Hedge Fund Elliott Management – which affected the deal structure forcing a 60 days go shop clause. The huge amount of debt which Dell has committed is expected to be repaid using the cash flows of the combined entity. To fasten the repayment process is expected that the combined entity will sell assets that synergies will make unnecessary together with market based operations like the already rumoured IPOs of Pivotal and SecureWorks (the latter could eventually be a multi billions IPO). EMC is a cash cow company, whose product offering is facing a declining demand. Nevertheless, Dell is acquiring EMC in a $67bn deal. What brought Michael Dell and the company’s management to the conclusion? Here follows the rationale for the transaction. EMC’s investment in VMware (VMW) has been a success driving the Group’s growth. Out of $24.4bn in revenues, EMC last year generated $5.5bn in free cash flow, resulting in a 22.7% cash flow yield. Stable and strong free cash flow will help repay the new $50bn debt issued to finance the transaction. Assuming that the financing for this deal will be without any other difficulty related to unsold debt (which can be highly discussed given recent decline in demand for high yield loans) the big amount of cash flows generated will also improve credit profile. Furthermore, relevant synergies are expected from the transaction, with revenue synergies expected to be $2bn, that is three times the cost synergies. Indeed, Dell is planning to sell EMC’s solutions to some of its customers, pointing to over $1bn in potential additional annual revenue. As a result, Dell will complete its product offering, thus recovering a competitive advantage relative to competitors like Hewlett-Packard and IBM. Global M&A activity surged in 2014, climbing to nearly the pre-crisis level. And, in the beginning of 2015, global M&A activity in 2015 was expected to grow even further, surpassing the pre-crisis level, due to several reasons among which are an increase in shareholder activism, a record high cash reserves in companies’ balance sheets and limited organic ways for an increase in top line growth. Although this outlook was thought to be too optimistic for some investors, global M&A activity seems to be doing far better than the already promising expectation. In the first ten months in 2015, there already have been 46 mega M&A deals, which means more than $10bn. Hutchison Whampoa kicked off the mega deal with its £10bn merger plan with O2, followed by Charter communication’s $79.6bn acquisition of Time Warner Cable and AB InBev’s $104bn acquisition of SAB Miller, Avago Technologies’ $37bn takeover acquisition of Broadcom and many more deals. Along with an unprecedented number of mega M&A deals in the world, Dell’s recent announcement to acquire EMC for $67bn caught press attention. The striking aspect of this Dell-EMC deal, which would be the largest technology takeover of all time, comes from Dell’s transaction history that Michael Dell, the founder of Dell, took the public company private with the help of the renown private firm, Silver Lake Partners, in 2013. After 2 years of Dell’s undisclosed adventure, the very first public move made by Dell would have been more than enough to catch the public’s attention. The unprecedented attention to the Dell-EMC takeover deal seems obvious since the very first move made by Dell happens to be the biggest tech takeover in history with the help from the very same firm that Michael Dell took the company private with. ← Gas: buy or build?